Yesterday I posted tips for one of my favorite rainy afternoon activities - fort building. Today I'm sharing the activity that I keep in my other pocket - obstacle courses. The trick to a good obstacle course is to include elements that will be challenging, but not so difficult that the children can't do them. When I create an obstacle course I use items that are already in my classroom, but I try to think of ways that they can be used differently - chairs become tunnels that they have to slither through, pillows become stepping stones, and rulers are for jumping over. This gets the children excited about the obstacle course - they want to try out something new to see if they can do it too. I always go through the obstacle course first. This way the children can see exactly what I expect them to do in each area, and they love to see me complete it too. I usually set up the first round. I like to create a looped course so that when the children are done they can start over again and continue as many times as they wish. When they get tired of the original course I encourage them to help me come up with ideas to change it up. If obstacle course are something that you do regularly, how could you change it up? Make them number games and give each area a number card - that's how many times the children have to complete the action (walk around the chair 4 times, jump on the pillow 2 times) this way they get number recognition and counting practice while doing the obstacle course. Make it a buddy course, where the children have to complete the entire course while holding hands with a partner. Then you can pair them so that faster children have to work with children who take more time this way each child will learn patience. When you're setting up an obstacle course you want to make sure that you've got elements that children can go over, under, and around. You can also add things that they have to squeeze between, and spaces between elements where they have to hop, skip, or roll. 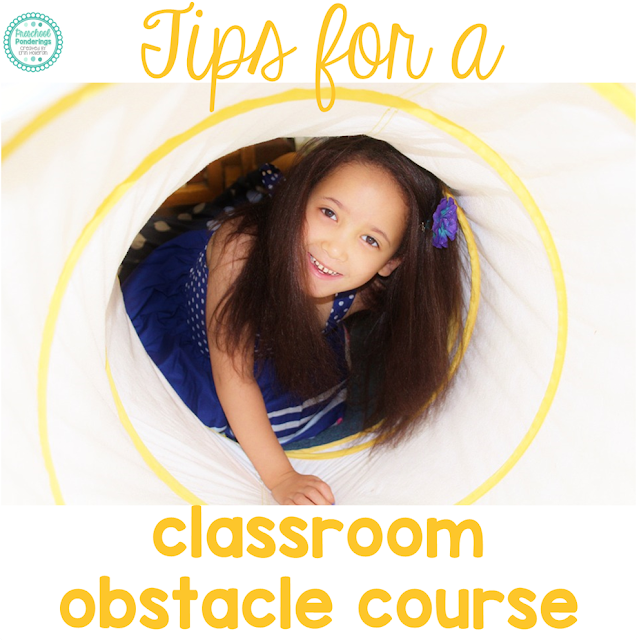 An obstacle course can turn your classroom into an entirely different world, consider giving your obstacle course a theme - like a jungle course, an outer space course, or an underwater course. Then children can play the part that goes along with the theme in addition to completing the obstacle course!